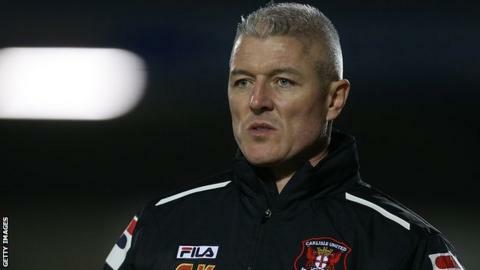 Carlisle's draw at Crawley took their League One relegation fight to the final day, where they must beat Wolves and hope other results go their way. In a tight first half, Carlisle started like the side with much more to play for, but could not create an opening. Crawley's Jamie Proctor was sent clean through just after the break, but was too ponderous and saw his effort saved. Shortly after, Carlisle midfielder Liam Noble went closest to a breakthrough when his 20-yard shot struck the bar. To have any chance of avoiding the drop, the Cumbrians must become just the third team to defeat champions Wolves on their home patch in the league this season. If Crewe draw or Tranmere win, Carlisle will be relegated regardless. Match ends, Crawley Town 0, Carlisle United 0. Second Half ends, Crawley Town 0, Carlisle United 0. Kyle McFadzean (Crawley Town) is shown the yellow card. Jordan Pickford (Carlisle United) is shown the yellow card. Courtney Meppen-Walter (Carlisle United) is shown the yellow card. Brad Potts (Carlisle United) is shown the yellow card. Corner, Crawley Town. Conceded by James Berrett. Corner, Crawley Town. Conceded by Jordan Pickford. Attempt saved. Jamie Proctor (Crawley Town) right footed shot from the centre of the box is saved in the bottom left corner. Attempt missed. Gwion Edwards (Crawley Town) left footed shot from the left side of the box is high and wide to the right. Kyle McFadzean (Crawley Town) wins a free kick in the attacking half. Substitution, Carlisle United. Courtney Meppen-Walter replaces Liam Noble. Brad Potts (Carlisle United) wins a free kick in the defensive half. James Berrett (Carlisle United) is shown the yellow card. Foul by Andy Drury (Crawley Town). Substitution, Carlisle United. Kyle Dempsey replaces Lewis Guy. Attempt missed. Brad Potts (Carlisle United) right footed shot from outside the box is high and wide to the left. Attempt missed. Matt Tubbs (Crawley Town) left footed shot from the left side of the box is high and wide to the left. Chris Chantler (Carlisle United) wins a free kick in the defensive half. Matthew Sadler (Crawley Town) wins a free kick on the right wing. Foul by Sam Byrne (Carlisle United). Matt Tubbs (Crawley Town) is shown the yellow card. Foul by Matt Tubbs (Crawley Town). Attempt blocked. Gwion Edwards (Crawley Town) right footed shot from the left side of the box is blocked. Corner, Crawley Town. Conceded by Chris Chantler. Corner, Crawley Town. Conceded by David Symington. Matthew Sadler (Crawley Town) wins a free kick in the attacking half.